Frosted Flakes, Corn Flakes, and Kix may get pricier as the yields of crops such as rice, wheat, and corn all fall. The price of popular breakfast cereals is set to soar over the next 15 years as a result of climate change, argues a new report from Oxfam International. If left unchecked, the effects of climate change on basic crops—like rice, wheat, and corn—could drive up the cost of Kellogg's Frosted Flakes in the U.S. by up to 20 percent by 2030, according to Oxfam's analysis. Corn Flakes could also rise up to 30 percent in the U.S., and up to 44 percent in the UK, while the cost of General Mills' Kix cereal could go up by between 12 and 24 percent in the U.S. And that's on top of any other price increases due to inflation. The new report, called "Standing on the Sidelines," also calls out what Oxfam dubs the "Big 10" food and beverage companies for not doing enough to combat climate change by cutting emissions from their agricultural supply chains and lobbying for governmental action. Oxfam argues that warming is already having an impact on the American breakfast table. "In rich countries at the moment, we're starting to see the impacts in people's pockets, having to pay more for the products that they are used to consuming on a daily basis," says Oxfam's Tim Gore, one of the report's authors. Staples like corn and rice will double in cost by 2030, with half of that increase due to climate change, according to the report. To estimate the impact this will have on the retail prices of specific products, Oxfam constructed a model using "historical grain and consumer product prices, product ingredient lists and nutrition labels, and historical examples of how rising commodity prices affect retail prices." Earlier this year, the UN's Intergovernmental Panel on Climate Change reported that changes in temperature and precipitation together could contribute to global food cost increases somewhere in the wide range of 3 to 84 percent by 2050. "As yields fall, prices rise, and so what this is going to translate into is higher prices for things like breakfast cereals," Gore says. Oxfam says climate impacts can be felt elsewhere on the breakfast table, too. "Look at your cup of coffee," Gore says. "Certainly coffee is one of the crops that is most vulnerable to climate impacts. We're seeing that right now across Central America, and Guatemala in particular, where, as temperatures increase, there's a particular fungal disease called coffee rust, which is devastating the coffee crop across the region." According to the Oxfam study, high temperatures killed up to 40 percent of Guatemala's coffee harvests in 2013–2014. The IPCC recently stated that the amount land suitable for growing coffee in Costa Rica, Nicaragua and El Salvador will be reduced by more than 40 percent, while coffee crops in Colombia will be forced to higher altitudes. "What this means for consumers in the US and elsewhere is that the very high-quality Arabica coffee beans that we like to enjoy will become more scarce and therefore more expensive," Gore says. Oxfam says there's evidence to suggest that the breakfast cereal industry is already vulnerable to bad weather. General Mills told investors in March that recent brutal winter had dampened economic performance: "We lost 62 days of production…Trucks could not move, and the rail system becomes less efficient," said Ken Powell, the CEO of General Mills. "It disrupted plant operations and logistics," he explained. 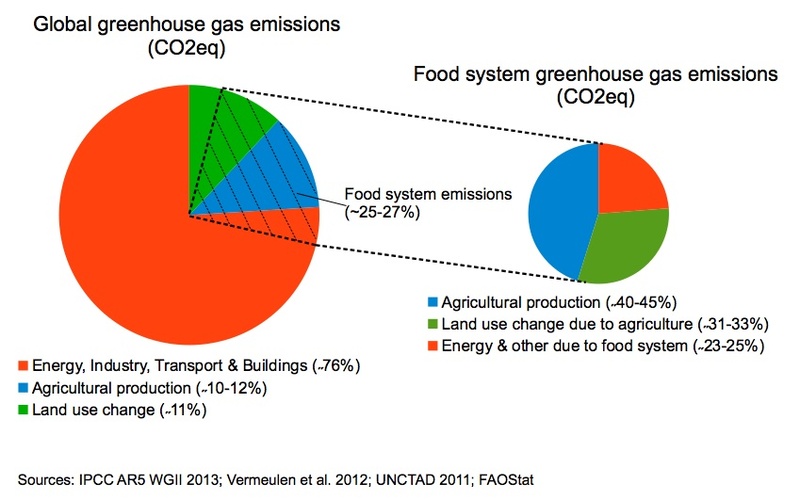 So what are the major food producers doing to limit the threats posed by climate change? One of Oxfam's major findings is that while these companies have all set targets to reduce some of their emissions, they are failing to take the necessary steps to rein in the biggest proportion, on average, of their footprint: the so-called "Scope 3" emissions that come from their supply chains. (Scope 1 and 2 emissions, by contrast, come directly from the companies' own operations). These Scope 3 emissions can include things like direct emissions from land use—cow flatulence, for example—and the indirect carbon emissions caused by ripping down forests for farmland. In total, these Scope 3 emissions account for around 50-60 percent of the emissions footprint of the 10 companies combined, according to Oxfam. That's equivalent to the emissions of about 40 coal-fired power stations. 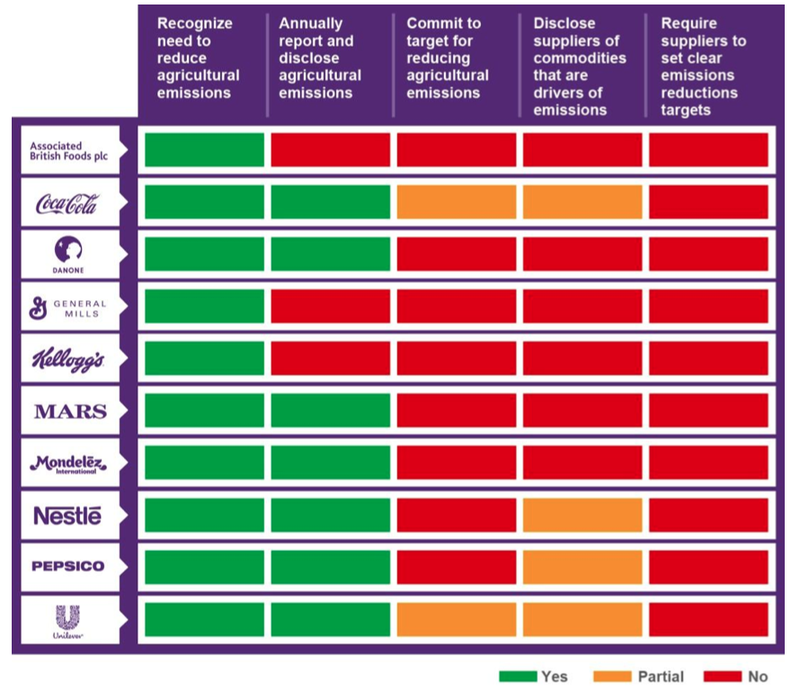 Significantly, according to Oxfam, none of these companies "have committed to a target to reduce their total agricultural emissions or require their suppliers to make reduction targets." "Those targets that they've set are only covering a very small proportion of their total emissions footprints," Gore says. "So really what we're asking them to do is face up for the significant emissions that they are responsible for, to get their own house in order." There is one example Oxfam wants these major brands to follow. When PepsiCo's UK operation discovered that half its emissions came from its upstream supply chain, the company committed to a 50 percent reduction in its water use and carbon emissions over five years, swapping out inefficient crops and helping farmers monitor their yields more accurately. "If the Big 10 took on that commitment, they could reduce emissions by a further…80 million tons of carbon dioxide equivalent per year, below business-as-usual emissions, by 2020," Gore says. "That's a pretty substantial additional savings; it would be a significant contribution to the global effort to close the emissions gap." The report also commends Coca-Cola for setting a goal of reducing emissions by 25 percent across the entire lifecycle of the the "drink in your hand." But Oxfam says such targets "do not guarantee that emissions from agricultural production will decline (as reductions could all be delivered elsewhere in the product's life-cycle)." A Coca-Cola spokesperson acknowledged in a statement that not all reductions across their entire operations "will be equal" but says the company is "engaging with 150 of our key supplier partners and exploring options to reduce emissions from our agricultural supply chain." We serve on the steering committee of The Consumer Goods Forum, and as a member of the Tropical Forest Alliance, which is actively engaging governments in Asia and Africa on the important issue of climate change. We are also a member of the Roundtable on Sustainable Palm Oil, which engages governments on issues related to deforestation and climate change in Indonesia and Malaysia. General Mills also participates in the US Department of Energy's Better Buildings Challenge with the goal of reducing its energy intensity by 20 percent over 10 years. The company claims to have cut its energy usage rate by 10 percent since 2005 and to have trimmed its greenhouse gas emission rate by 20 percent. We regularly engage with stakeholders on the important topic of climate change, along with a wide range of issues. This includes Consumer Goods Forum, Global Environmental Management Initiative, Carbon Disclosure Project and Sustainable Agriculture Initiative, and others. We are also members of The Sustainability Consortium, a network of leading companies seeking to promote sustainability throughout the product lifecycle of consumer goods. Oxfam's Tim Gore acknowledged that some companies were performing better than others, but said that his organization's overall aim in pitting them against each other in this way was to provoke a "race to the top." "We want them to be competing against each other to improve, and to drag up the standards across the industry." This story appears at The Atlantic as part of the Climate Desk collaboration.